This is all the cooling I need in my shop. It’s nice being nearly immune to the heat. Do you have air conditioning in your shop? Do you run it a lot? Before Hurricane Katrina, I had a little 5000 BTU window unit that I would occasionally put in a casement for temporary use, but I had to be desperate. As a fan of hot weather, I don’t see the need for it often, even in our South Mississippi heat and humidity. After Katrina, the point was moot, as the AC was sitting on the floor of the shop when the flood waters came, and few things electronic survived that horrible, nasty, hypersaline water. One day, it was gone. Not that I couldn’t afford to buy one; I think they are under $100. But, what isn’t sweeter when it’s free? 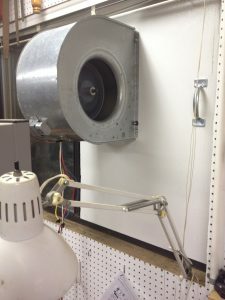 A while back I built the squirrel-cage fan “window unit” that installs in 2 minutes and 4 seconds. I’m fortunate, though, I’m not affected much by the heat, and don’t even use the exhaust fan often. Which means Lowe’s shouldn’t hold its breath waiting for me to come and pick up one of those $100 loss leaders. I grew up on the coast where it was foggy and cool. Daytime highs durring summer often were in the low to mid 60s or what I called t-shirt weather. For the past 5 years I moved inland about 40 miles. Most days it’s in the 90s (or what I like to call the 6th circle of hell). I put the biggest portable unit I could find in the well insulated garage. It’s not enough. Wife has given me permission to put a workbench in the house as I work only with hand tools so no fine dust to deal with. The weather won. When I built my shop, I installed an 18,000 BTU heat pump. It does fine for cooling, but is inadequate for heating. When the outside temperature drops below freezing, it can’t “find” enough heat to maintain more than 60 degrees. I had to add a gas wall heater for winter. AC, not swamp, which adds humidity. Not just the heat but with this South Mississippi humidity on the Gulf Coast I run my AC year round as well as a dehumidifier. My new shop came with no AC in the big shop area of about 1500 sq ft. even with 16′ ceilings for a heat trap, Nashville gets too hot for my comfort. I found an old “gas pack” home central unit that the heat exchanger had gone bad on…I have heat, didn’t need more…I paid $50. for four tons of AC. I mounted it on dolly wheels so I can roll it out of the garage door half way so it exhausts properly. I bought a sq. to rd. adapter two 16″ 90’s and a 3′ stick of duct and bam…I had a cold stream of air at just above head level…works like a dream…for cheap. I live in Mesa, AZ where it is currently over 100 daily. My shop is pretty well insulated but I do need to turn on the AC if I am going to be in the shop very long. The unit is a “mini-split” and I would highly recommend it for shop use. It works like a heat pump so I can use it as a heat source in the winter. Living in south Mississippi, I built my new shop with an HVAC system and it runs from about May until October. half to reduce the heat but more to control the humidity. Everything in there, including me, benefits from the lower humidity. The only complication (and collateral benefit) was the need to also install a central dust collection system… and use it… to keep as much dust as possible out of the HVAC. Interestingly, when i lived up north we spent summers working on outside projects and the winter hiding in the workshop. Here, it is exactly the reverse and I’m entering the season of “hiding in the workshop” Outside projects will be on hold until “Winter”. I live in St George Ut and it gets really hot in the summer, but we dont have humidity so I dont need it. I have a couple of fans mounted on the wall and the sun faces in the right direction, so I never get overheated. I just leave my Garage door open. As an hobby woodworker, I don’t need it in San Diego. I leave near the coast and commute to work via bicycle. Thanks for sharing this post! Glad to hear you adapt just well in a hot weather although, I can’t say the same for me when I am doing woodwork in my shop. I used it in between whenever I feel I’m about to profusely sweat or spend a lot of hours in there. It’s indeed true, it’s a lot sweeter when you get things for free! lol I am attune to a hot weather, but I usually do my woodwork outside under a shade. I hope you can post or tell us about your woodwork projects in your next article.